I was really excited to read Arclight by Josin L. McQuein because I do love post-apocalyptic fiction and sci-fi. 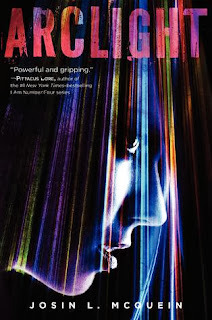 Arclight started with a bang; there was so much action that I was wrestling between a feeling of suspense and ‘What’s going on?’ Luckily, some questions are answered relatively quickly, but in another sense, I felt disconnected from the story. Marina, the protagonist, has no memory of who she is, where she’s from, anything. She was found in the Grey; the boundary between the Arclight where it’s safe and the Dark which creatures called the Fade inhabit. When the story starts she’s been living in the Arclight for a few months and is alienated from the other students and detested in the case of one boy, Tobin, whose father was killed rescuing Marina. After the fast-paced beginning, the action slowed down. The middle was sedentary but luckily, the ending was where it picked up. Besides Marina and the two love interests, none of the other characters were particularly memorable. I really enjoyed McQuein’s writing style. I love reading stories in first person, present tense. However, apart from the great writing, I found it hard to connect with Marina. I never got to know anything substantial about her. I felt rather indifferent in the end. Even when she learns the truth about her past, she doesn’t find out about what she was like as a person, about those important to her and so on. There are two love interests, but I didn’t know enough about either one to have a favourite. Finding out the truth about Marina and the Fade were the reasons I carried on reading the book. The Fade were an interesting and well-formed idea and should definitely have had more page time. What disappointed me the most was the ‘twist’ towards the end because it could have been resolved much, much sooner and saved a lot of confusion, heartache and pages. Actually, I wouldn’t call it a twist as much as done for the sake of convenience. Also, I had some unresolved question about the villain. The ending was satisfactory but didn’t leave me with a feeling that I have to read the sequel, Meridian. Thank you for that interesting review, Kulsuma!